Adopted on February 26, 1925. The flag of the state of Oregon is a two-sided flag in navy blue and gold with an optional gold fringe. On the front is the escutcheon from the state seal and on the reverse is a gold figure of a beaver, the state animal. Oregon is currently the only U.S. state to have a two-sided flag (the Flag of Massachusetts was changed in 1971 to be single-sided). 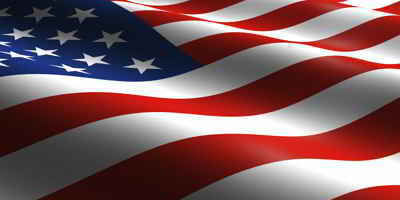 Adopted in 1925, the flag is colored navy blue with gold lettering and symbols. Certain occasions demand a more formal version of the flag and so a "dress" or "parade" version of the flag is fringed in gold . The flag of Oregon is the only state flag with different pictures on each side. Both sides are navy blue with all lettering and symbols in gold, representing the state colors of Oregon. 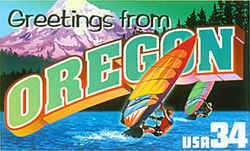 On the obverse, the legend STATE OF OREGON is written above an escutcheon, which also appears in the Oregon state seal. The shield is surrounded by 33 stars, representing Oregon's admission to the Union in 1859 as the 33rd state. The scene on the shield shows the sun setting over the Pacific Ocean, mountains, forests and a covered wagon. A plow, wheat and pickax represent farming and mining. Of the two ships: The one leaving is a British ship and the one arriving is a United States ship representing trade. The eagle represents the United States. On a banner are the words "The Union" representing support for the United States. 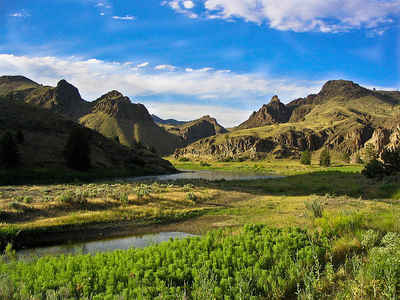 Below the shield is written 1859, the year in which Oregon became a state. Oregon's flag is the last remaining state flag in the U.S. in which the obverse and reverse sides have different designs. Paraguay is the only country that still has a two-sided flag. Two-sided flags were previously more common, but have been reduced due to increased costs of manufacturing a flag with two different designs. On the reverse of the flag is a depiction, also in gold, of a beaver, the state animal of Oregon. Oregon has the only U.S. state flag with differing symbolism on two sides. Oregon Revised Statutes 2005 Edition, Title 19, Chapter 186. 186.010 State flag; official colors (1) A state flag is adopted to be used on all occasions when the state is officially and publicly represented, with the privilege of use by all citizens upon such occasions as may be fitting and appropriate. 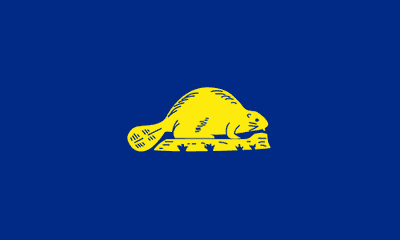 It shall bear on one side on a navy blue field the state escutcheon in gold, supported by 33 gold stars and bearing above the escutcheon the words "State of Oregon" in gold and below the escutcheon the figures "1859" in gold, and on the other side on a navy blue field a representation of the beaver in gold. 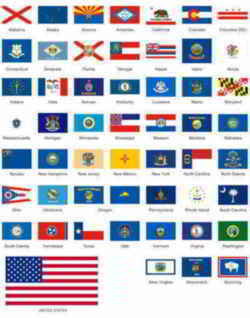 186.110 State flag to be displayed on public buildings. (1) The person or body having custody of each public building shall procure an Oregon State flag of suitable size and shall cause the Oregon State flag to be displayed with the United States flag upon or near such public building during the hours when the United States flag is customarily displayed, except in unsuitable weather, and at such other times as seems proper. 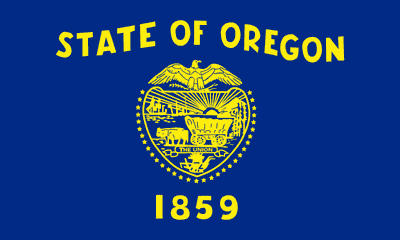 (b) All other state buildings upon which the Oregon Department of Administrative Services determines it is suitable to display the Oregon State flag.